Supply Chain Ecosystems are made up of a network of organizations, people, activities, information, and resources all of which are involved in moving a product or service from suppliers to customers. This course will show you how modern supply chains have evolved into complex international networks as well as how they bring economic and social benefits that lead to a steady improvement in the standard of living for millions. This course will first introduce you to ecosystems. You will learn that ecosystems are comprised of a network of institutions, resources, delivery services infrastructure, and supply chains. You will study how they all interact together with the economic and industrial landscape and climate. You will look into the different constituents of the supply chain ecosystem and the drivers of supply chain competitiveness. The business course will also discuss the Social-ecological Systems (SES) Framework, which can help in the study of governance, risk, innovation, and performance. You will then study the Five STERM Forces as well as the main types of resources including natural resources, human resources, financial resources, and capital assets. You will learn that the Social Economic Zone (SEZ) is a geographical region that has economic laws different from the rest of the country with the goal of attracting foreign investments. You will also study clusters and how they help companies to operate more productively in sourcing inputs and accessing information, technology, and human resources. 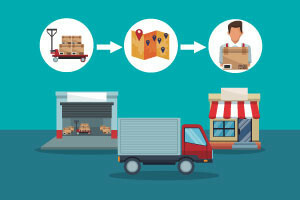 In this day and age, the modern supply chains distribution system has become complex, multi-layered, and inter-connected in such a way that companies and countries are able to trade more effectively and efficiently. This business course will guide you through the supply chain ecosystem in a clear, step-by-step manner so that you can fully understand this vital element of the modern economy. Check out the course today, and give your résumé a boost in no time. Define what supply chain ecosystem is. Describe how to map a supply chain ecosystem. Describe how to use the ecosystem framework in supply chain analysis. Describe how modern manufacturing and services are intertwined.